← The Sports Archives – What Skills Do You Need To Become A Badminton Champ? The Sports Archives – The Guide To Getting Better At Tennis When You Hit A Plateau! Reaching a plateau is tough to take. You’ve been going upwards for months and your play doesn’t seem to get any better. Everyone from the total novice to the hardened veteran has experienced this before. The important point is to never quit. All plateaus can be broken and anyone can become a better tennis player. This is the essential guide you need for getting through the hard times and becoming better at the game you love. Treat every serve like a second serve. A common mistake players make is to fire their first serve in the hope of an ace. Most of the time, they’ll miss and place all the pressure on their slower second serve. You’ll have far more double faults than you will aces. Act like every serve is a second serve instead of firing in balls with reckless abandon. There are points you absolutely have to win and points you can’t lose. With the former, you’ll take more risks. In the latter case, you’ll play conservatively until your opponent makes an error. At the lower levels of the game, mistakes are high, so it’s better to simply wait your opponent out. Only when you reach the professional level do you have to start taking big risks. The block back serve return is perhaps the most underrated shot in tennis. Don’t put any power on the ball and just spin their serve back to them. This will encourage them to hit their serves harder next time, which increases the error rate and forces them to generate the power to hit the ball back. Professional players love overhead smashes. Everyone else usually can’t hit them, and if they do hit them the ball ends up hitting the net. It might look cool, but more often than not you’ll blow the point. Let the ball come down and hit it on the volley, or let it bounce and hit it back. It’s all in the numbers. You might play more conservatively, but you’ll win far more points if you lay off the style. Learn how to perform the overhead smash as you start to face better and better players where such hits are necessary. Let the lob into your game. The lob is a simple shot that aims for the line at the back. In the heat of a game, this simple shot can completely throw your opponent off their guard. It forces them to turn around and generate power again. The more your opponent has to move the better control you have over the game. If you need an advantage on a crucial point, come forward from the backline by one or two metres. This will completely throw them off on their serve. That second of doubt and the confusion will drastically increase the chances of making a mistake. You’ll only get away with it a couple of times a game, but its psychological warfare at its finest. Gareth Shore is the brains behind this informative article. He is a certified healthcare professional and a fitness enthusiast. He shares his views and ideologies through his articles. He says he buys all his fitness and sports equipments only at Base Line Sports and suggests it to his readers. What Happened to Tennis Racquets of the Past? The 10 Best Women Tennis Players To Follow On Twitter! 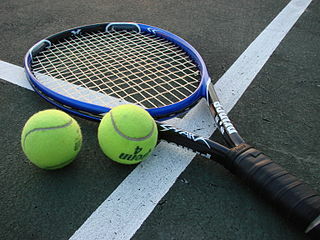 This entry was posted in Tennis and tagged block back serve return, sport, sports, sports and leisure, sports and recreation, Sports Archives, Sports Blogs, sports performance, tennis, tennis bags, tennis blogs, tennis equipment, tennis news, tennis skills tips, tennis strategy. Bookmark the permalink.